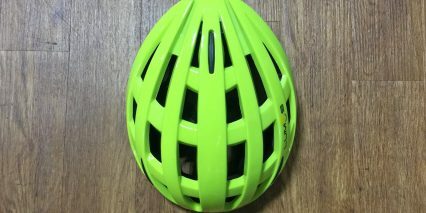 Length 12", Width 9.5", Depth 7.5"
I’m kind of a safety nut… having bumped my head on more than one occasion while mountain biking, been sideswiped and turned into by cars, and knocked out twice on my snowboard; so helmets are basically a requirement. Absorbing hard impact should really be a last resort though, right?! If you can ride safely and be seen by cars, avoiding impacts altogether, that would be ideal. And this is exactly what the Lumos helmet aims to do. 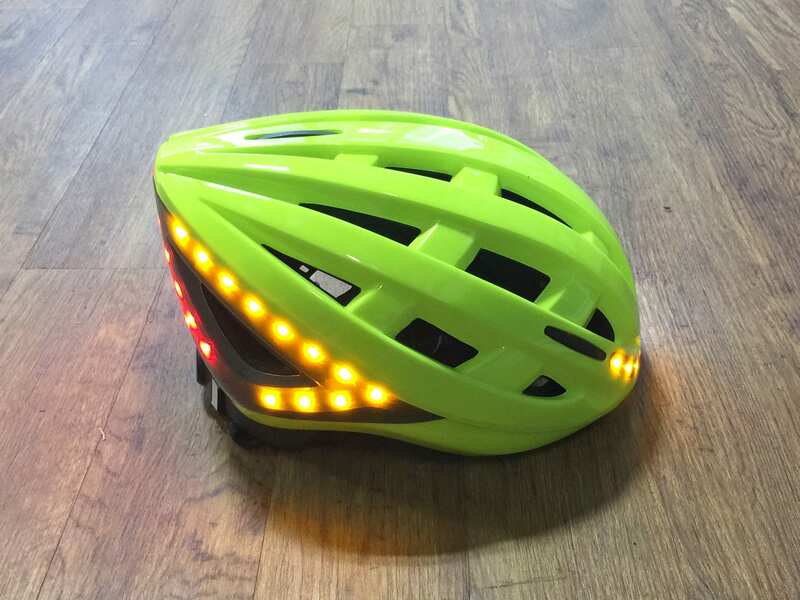 It’s a smart bicycle helmet that keeps you visible with a total of 48 embedded LED lights that can be activated as solid, slow-flashing, or fast-flashing while also enabling you to communicate your navigation intentions to fellow cyclists, motorists, and pedestrians through the use of yellow blinking turn signals. 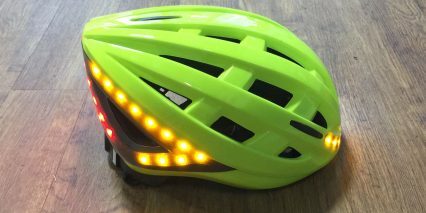 And, because all of these LED’s are positioned up high, on your head, they are much more likely to be seen by drivers and less likely to be blocked by clothing, bags, and other gear mounted to your bike frame. Frankly, I think it’s an amazing product… but there are some trade-offs to consider. Priced at $199, this is a very expensive helmet. 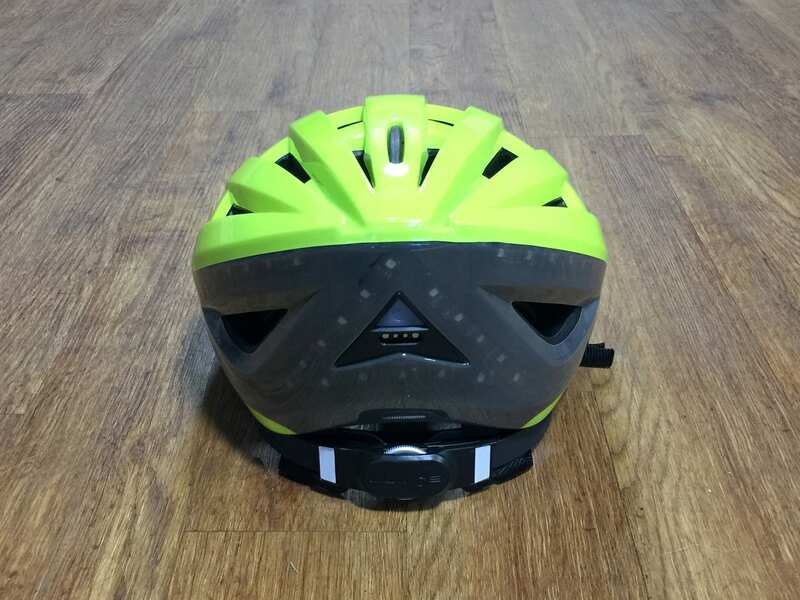 Compared to my $70 Specialized Echelon II helmet (which doesn’t have any lights or extra features, just reflective stickers) this thing is basically 3x the cost! 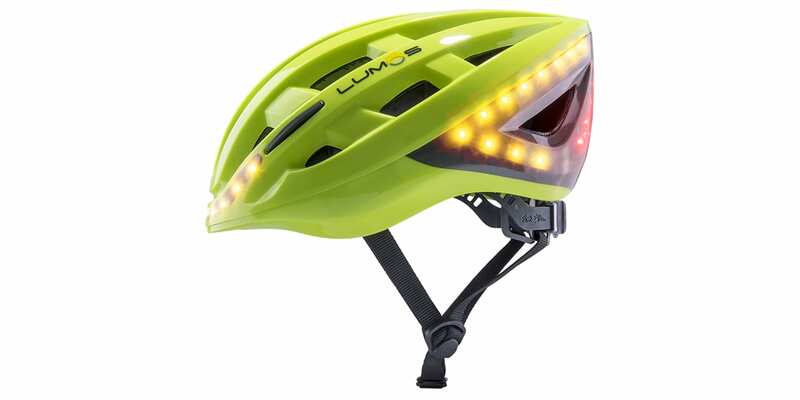 Occasionally, it seems that the Lumos helmets go on sale for $169 through their website, but even that is fairly pricy. And, the helmet weighs more than most non-smart helmets. 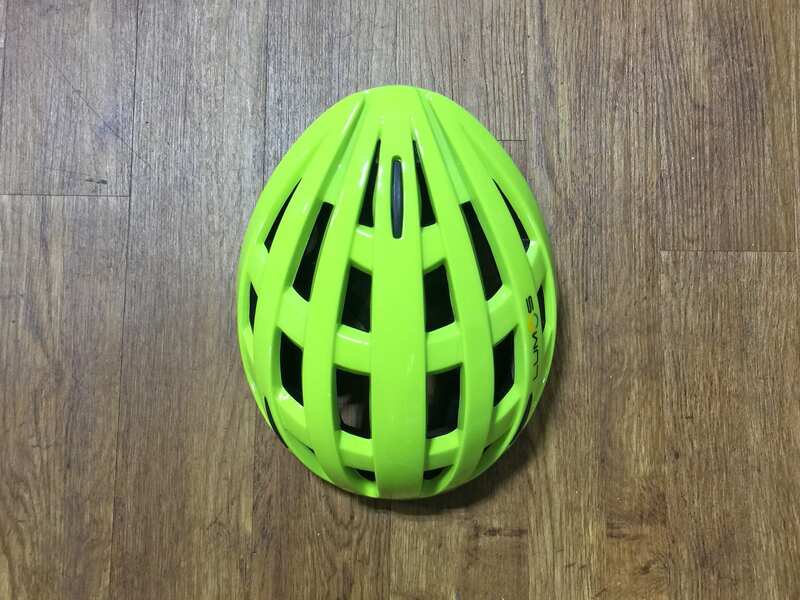 My Echelon II is ~0.8 lbs and while visiting a shop called Propel Bikes in Brooklyn, NY I was able to weigh a bunch of other designs that ranged from 0.7 lbs to 0.9 lbs depending on coverage, branding, and visor attachments. The Lumos helmet, by comparison, weighs almost exactly one full pound and does not appear to have any sort of visor or warmth accessories like ear protectors. 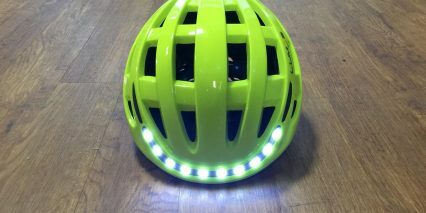 The helmet space has been evolving in recent years with products like the SENA helmet that has integrated speakers that can transmit your music, phone calls, and turn-by-turn GPS from a smartphone and the Specialized Centro LED helmet which is lightweight and cheap but only has one small LED light on the back. The Lumos is the brightest, possibly safest helmet I have come across, and the lights are covered by smooth, clear plastic strips that should keep dust and water out… it’s really professional despite debuting on Kickstarter in 2015 and remaining mostly unchanged for all of these years. 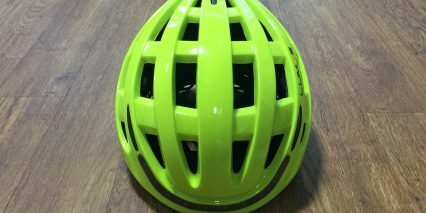 Since being launched, the Lumos Kickstart edition helmet has won a Eurobike Gold award in 2016 and a Red Dot design award in 2017. 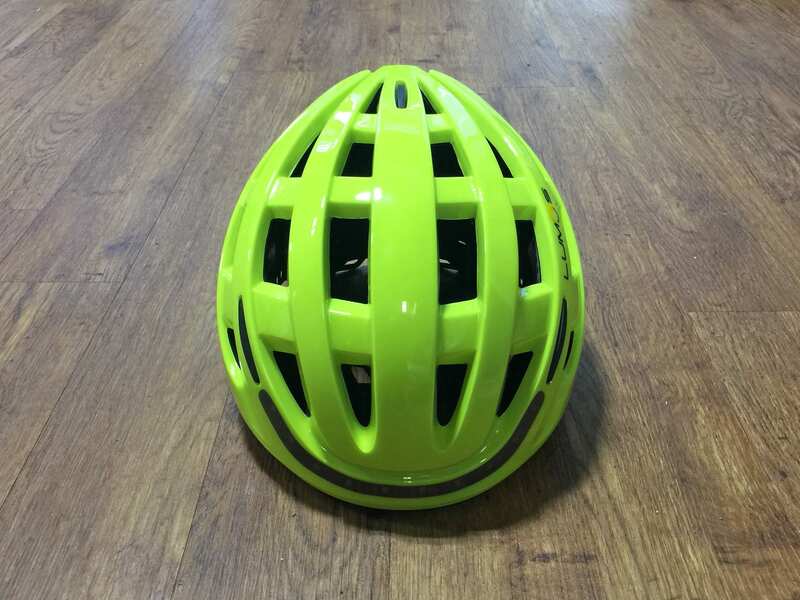 It has gone from being sold exclusively on Kickstarter to their own official website and now appears in some bicycle shops where you can touch and try it on. It looks like Amazon also carries the helmet direct from Lumos. The shop I visited, Propel, had several colors to look at, which was fun for the video review. And the owner, Chris Nolte, told me that he had sold several units to local customers who were very happy with them. 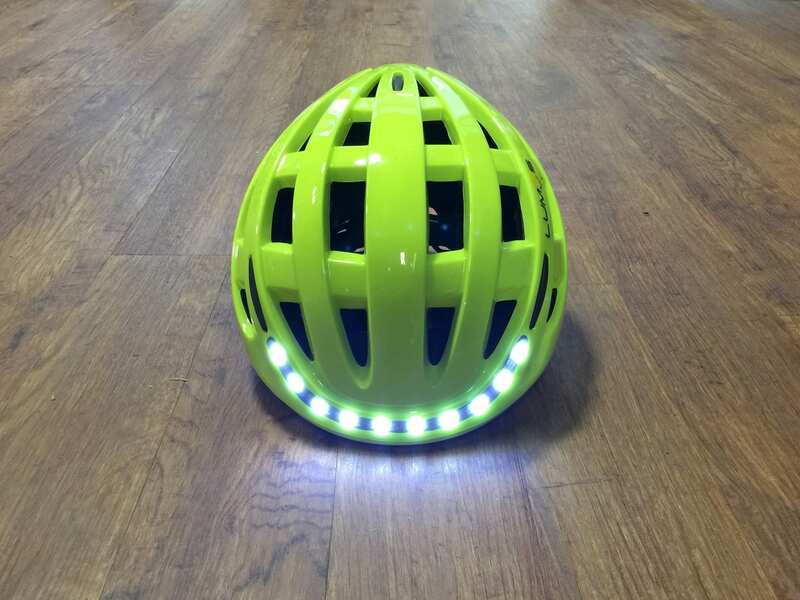 The helmet has an embedded rechargeable battery that you can fill with a little USB dongle and the same goes for the remote button pad with a rubberized L and R touch point. 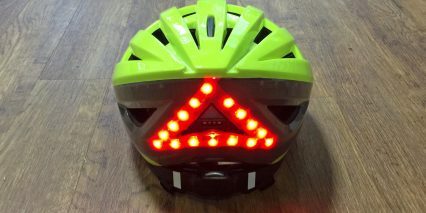 Once the helmet and dongle have been charged, you simply turn on the helmet by pressing a rubber button on the back (and you can keep pressing to cycle through the three modes: solid, slow flash, quick flash) and then hold either the Left or Right buttons on the controller unit to activate the turn signal feature. It appears that you do have to hold the button for a moment vs. just pressing it, but then it stays lit so you know that the turn signal is still going. You have to actively hold again to turn off the signal. It’s very simple and compact, but would still add some clutter and distraction to your basic cycling experience. It looks like the button pad and helmet communicate over a radio signal, and I’m guessing they went with something short-range to save power and avoid interference. The handlebar remote is removable, just twist and pull off, so you can keep it from getting stolen or bumped at the bike rack, but replacements are only $29 if something unfortunate does happen. Same goes for the charging cable, for ~$13 you can get a replacement or additional cable to charge both the helmet and remote simultaneously. I like that they went with standard USB Type A plugs and have a magnetic interface on the helmet and remote without any deep groves or rubber flaps to get dirty or pulled off. 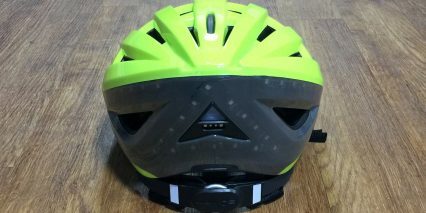 I cannot say for sure, but it seemed like both the helmet and button pad contain rechargeable Lithium-ion batteries which cannot be replaced. The helmet doesn’t have any sort of door or flap to show you where the battery is located, and even though there are screw holes on the control pad, I’m not sure where to get replaceable rechargeable batteries this small if you were to open it up. So, that’s a bit of a bummer, but Lumos has said that after the 2 to 3 years of use that you can expect to get from the stock batteries, it might be time to replace your helmet anyway. To maximize the life of Lithium-ion cells, I have heard that storing in a cool dry location is best, and that you can leave them at ~50% full for longer periods of disuse. You charge the button pad and helmet with a standard USB Type A dongle with a magnetic 4-pin plug, it works well and should be easy to plug in to your computer or power strips, it’s a very simple and universal charger that is super small and lightweight… just don’t lose the dongle! The Torch helmet seems to be $120 on amazon now. Anybody know how it compares? Nice! 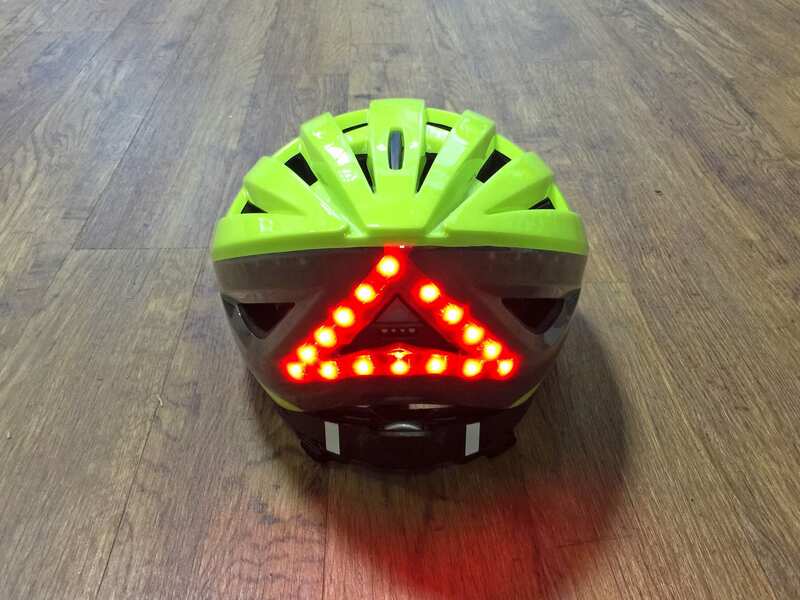 I haven’t tested that one as thoroughly but get the impression that it’s a simpler light without turn signals and that it might be heavier but has this BMX or skateboard type of styling vs. the aerodynamic cyclist styling. I’d love to hear your thoughts if you go for this Aron! I’m on my second Lumos helmet. The first one was toast after an over the bars crash landed me on my head. I have no memory of the crash, and after a five hour stay at the hospital emergency room returned home with a sore left groin pull. 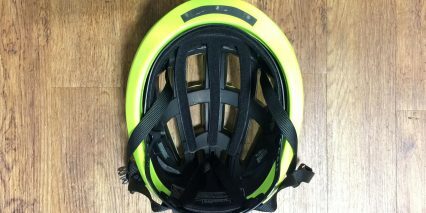 I wear my helmet every time I ride and have all three of my bikes set up with the turn buttons on the bars. 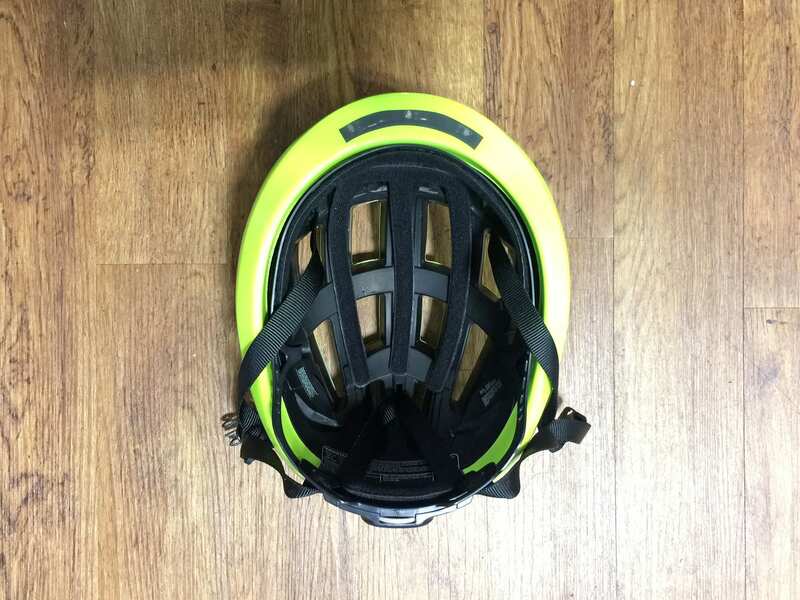 I charge the helmet after each ride (I ride between 30 & 50 mi /day, weather permitting). The helmet works flawlessly. I don’t ride without my Lumos helmet, my Cygolite HotShot Pro binkey, My Cycliq rear camera. and my Garmin Varia radar unit.